With a long pedigree in making precision technical drawing pencils, Faber Castell offer an impressive range of propelling pencils. From the super stylish TK Fine Pencils range to the more everday Grip and Gripmatic ranges there is something for every budget. 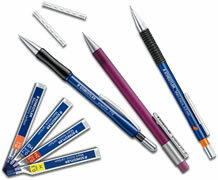 We also stock the full range of refill leads from Faber Castell. This excellent new propelling pencil from Tombow has the lead advanced in two different ways. You can either use the press clip or you can simply shake the pencil! Once at the required length simply slide the clip up to lock the lead in place. With a nice long twist eraser at the top and a really nice, chunky feel in the hand this is a new player in the mid range propelling pencil market. 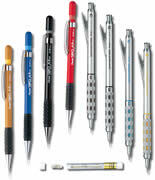 Pentel are well known for their high quality automatic pencils (otherwise called propelling pencils or mechanical pencils). From the utility Pentel A300 series to the lovely Graphgear 1000 pencil there is a pencil to suit every need and every budget. Pilot ENO Pencil Leads are extra strong and last longer than most other leads thanks to their clever polymer bonding technology. Available in sizes 0.3mm, 0.5mm, 0.7mm and 0.9mm in grades from 4B - 4H. 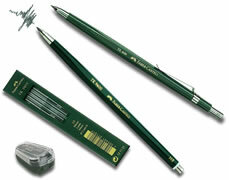 Pilot ENO Leads will fit any brand of propelling pencil of the appropriate size. 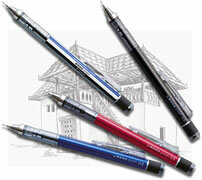 The Pilot Croquis is a twist action propelling pencil with a plastic barrel which has a broad, comfortable grip. 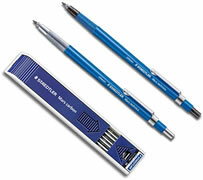 With 3.8mm thick leads available in three grades it is one of the nicest propelling lead pencils around. Refills are available here too!